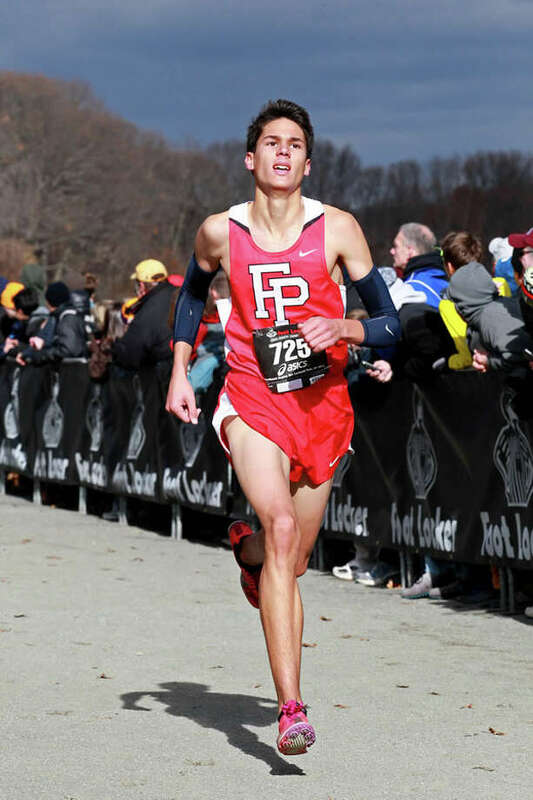 Fairfield Prep's Christian Alvarado races during his eighth place finish at the Foot Locker Northeast Regional Championships in New York on Nov. 24. MANCHESTER -- A year ago, Fairfield Prep's Christian Alvarado and Darien's Alex Ostberg were too injured to compete in the cross country state championships. Alvarado was sidelined with a stress fracture in his foot, while Ostberg had a fractured fibula. Both ultimately had another chance. Saturday at Wickham Park, Alvarado pulled away for the boys individual title in Class LL in 15 minutes and 55 seconds, and Ostberg was a runaway winner in Class L in 15:34. "I just did what I did two weeks ago in the (Wickham) Invitational -- get out to a good lead, make sure you don't get boxed or tripped up by anyone behind," Alvarado said. "I stayed relaxed the rest of the race." Ridgefield placed four runners in the top 11 at the 3.1-mile course -- including senior Trevor Hopper at No. 2 in 16:07 -- to claim the LL team title. The Tigers scored 60 points to easily beat FCIAC competitors Danbury, which placed second with 104 points, and Staples (105). Amity (147), Fairfield Prep (148) and New Milford (151) rounded out the top six. Darien recorded 40 points to win the L crown, comfortably ahead of runner-up Hall (56 points). South Windsor (131), Pomperaug (149) and Naugatuck (196) made up the rest of the top five. "Awesome," Darien coach Tyson Kaczmarek said to describe his team's win. "This is what we work for, this is it. This is what we want every year." The Tigers -- the FCIAC champion as well, having defeated Darien on Oct. 17 -- packed together and cruised through the steep hills and grassy paths at Wickham. Behind Hopper, who edged Xavier's Zachary Williams (16:16) for the runner-up spot, came Fairfield Warde's Aidan Fiol (16:17), then Ridgefield's Will Bordash in fifth (16:21), Austin Gilbert in ninth (16:26) and Gabe Altopp in 11th (16:31). This time, the Tigers didn't have Kristian Sogaard -- eighth at FCIACs -- who was hurt. Ethan Realander was the team's fifth finisher, coming in 35th in 17:20. "It was very satisfying," said Hopper, who finished first at FCIACs this year and took second at the LL meet last season, behind Staples' Henry Wynne. "We were a bit nervous that we wouldn't do as well since we didn't have Kristian racing with us." By the end, only Hopper was reasonably close to Alvarado. The Prep senior, who won the Wickham Park Invitational in 15:38 on Oct. 12, breezed along the course's gradual uphill finish. Staples' Oliver Hickson placed sixth in 16:22, while his teammate, Peter Elkind, was seventh in 16:23. Glastonbury's Randall Neish (16:25), Gilbert and Brien McMahon's Eric Van Der Els (16:30) rounded out the top 10. Ostberg took second at the Invitational 14 days ago in 15:41, but built a comfortable lead on Saturday. He clocked in at 15:34, besting Hall's Ari Klau (16:18). "This is my first year healthy at this meet. I came out here and got done what I needed to get done," said Ostberg, who also paced the Blue Wave to its third straight state title. "We're elated. "People had been telling me I had a really solid lead, but I wanted to keep pushing the pace, keep pressing it," the junior said. "I knew there would be people behind me. You never want to assume it's going to be an easy win." There were people behind him -- a few of them, his teammates -- but the win did come easy, at least according to the clock. Hall's Zachary Magin took third in 16:26, and behind him were Darien's Marshall Huffman (16:30) and Armstrong Noonan (16:30). Colten Appleby (17:07) and Ben Olsen (17:23) strengthened the Blue Wave's top five, placing 13th and 17th, respectively. Farmington's Palmer Weimann took sixth in 16:31, while his teammate, Matt Chisholm, was seventh in 16:35. Wilton's Spencer Brown (16:36), Pomperaug's Samuel Depalma (16:43) and Naugatuck's Dan Schumacher (16:44) rounded out the top 10.